Eight people trapped in a storage attic hiding from the Nazis in war-torn Amsterdam. Like the passengers on the Titanic, knowing their eventual fate may seem like a dreary exercise in heartbreaking melodrama. 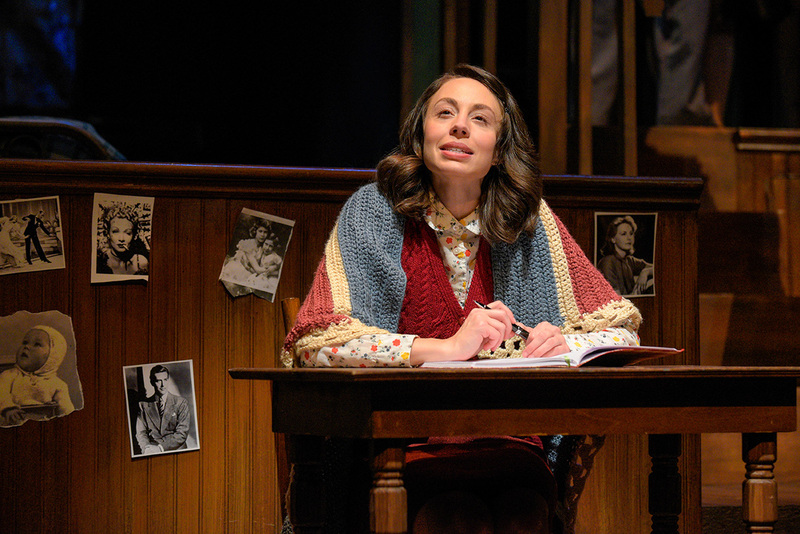 But Center REP's sensational production of Wendy Kesselman's Tony-nominated adaptation of The Diary of Anne Frank is wonderfully alive and full of vitality seen through the hopeful eyes of thirteen-year-old Anne, portrayed in a tour de force performance by Monique Hafen Adams. Director Timothy Near masterfully illustrates the unimaginable horror of the situation; the air raids, Hitler's radio rants and the police sirens that may indicate imminent capture. Forced into the tiny space they would inhabit for almost two years, the Frank family, Otto, Edith, Margot and Anne share their lives with good friends the Van Daans (mother, father and young son Peter). Hidden by Miep Gies (Allison Quin) and Mr. Kraler (Paul Plain) bring them rationed food and supplies, and news from the outside. An eighth character is added to the mix - dentist Mr. Dussel (Michael Patrick Gaffney), further adding to the claustrophobic atmosphere brilliantly realized in Nina Ball's multitiered sectional set design cluttered with cots, books and boxes. The audience is the fourth wall, witness to every daily movement and private moment of the characters. Anne addresses us directly, exposing the thoughts he diligently writes in her diary. The ensemble cast is solid through and through. Kevin Singer's Peter is shy and awkward, his father and mother (Michael Butler and Domenique Lozano) quibble but love each other, and Mr. Dussel (Michael Patrick Gafney) is abrupt, standoffish but becomes part of the extended family by osmosis. Margot Frank (Maya Michal Sherer) is the dancer and loving sister. 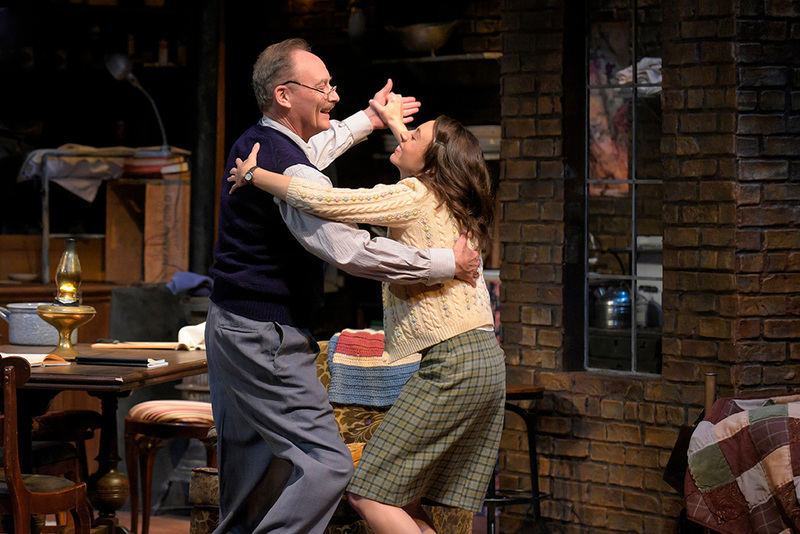 Otto Frank (Victor Talmadge) is the solid glue that hold the group together, while his wife Edith (Marcia Pizzo) is the emotional, heart on her sleeve counterpoint. A terrible chapter in the history of mankind comes to life as seen through the eyes of a young girl who somehow manages to retain her enthusiasm for life in a world gone mad. That girl, of course, is Anne Frank, whose diary became the focus of the 1956 Pulitzer Prize-winning play “The Diary of Anne Frank.” Set in the top floor of a warehouse in Nazi-occupied Amsterdam, the play chronicles the Frank family’s life in hiding from 1942 to 1944. Joined by the Van Daan family and Mr. Dussel, the eight people lived in very tight quarters where they were forced to be quiet during the days when the warehouse was occupied. In 1944, the Gestapo discovered their hiding place and took them into custody. Everyone except Anne’s father perished in concentration camps. 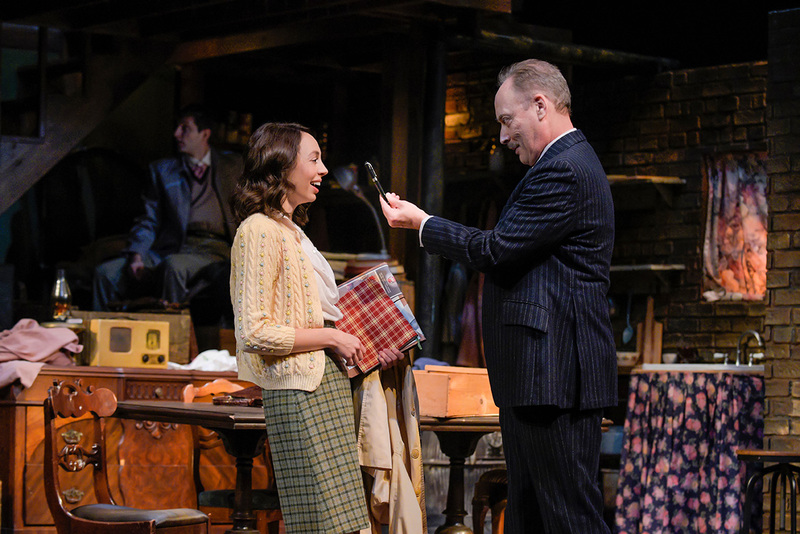 “The Diary of Anne Frank” has proved a powerful choice for theater companies since in premiered at Broadway’s Cort Theatre in 1955, and the Center Repertory’s Theatre Company’s production is no exception. 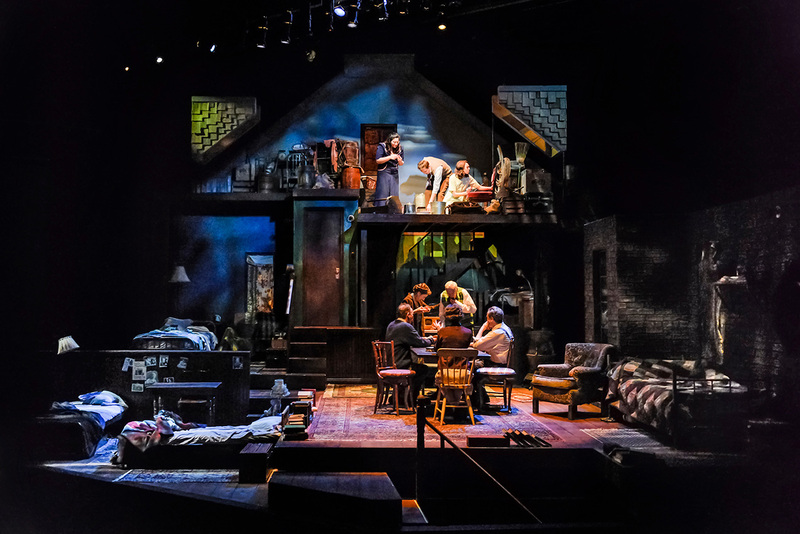 Nina Ball has designed a striking, multilevel, heavily-detailed set made all the more arresting with Kurt Landisman’s incredible lighting and Teddy Hulsker’s sound and projection design. You know you’re in for a visual treat from the start as the Frank family is spotlighted under an umbrella in the pouring rain, rain that is projected across the entire stage, as they walk to their new home at the warehouse. Director Timothy Near has not only found a dynamite cast to portray these well-known characters, but she has also added so many wonderful touches to make this commanding drama even more so. The subtlety of the acting combined with the realistic blocking makes the audience feel that they are truly peeking in on a group of people dealing with unimaginable stress and fear. Near continues this even during intermission. The lights come up and ushers open the doors, but the actors are still walking around the set doing household chores until 15 minutes later the lights once again go down and the mesmerizing story continues. Near continues this even during intermission. The lights come up and ushers open the doors, but the actors are still walking around the set doing household chores until 15 minutes later the lights once again go down and the mesmerizing story continues. 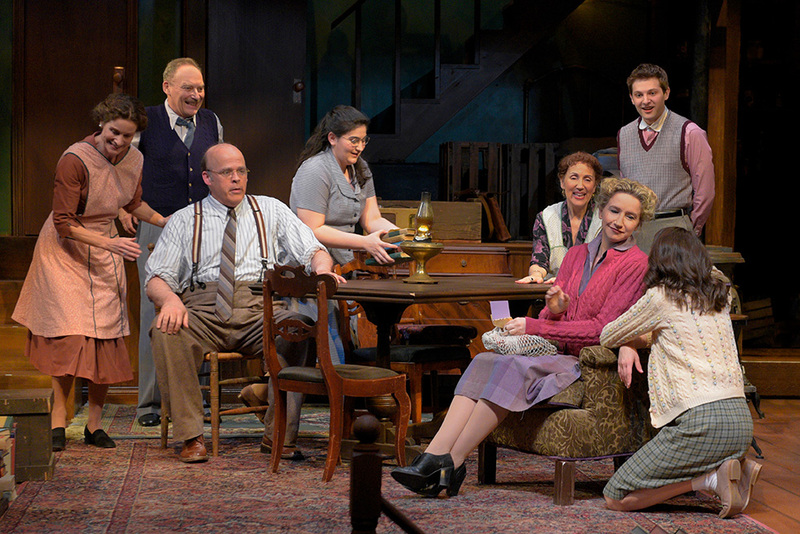 The superb cast features Monique Hafen Adams (Anne), Victor Talmadge (Otto Frank), Marcia Pizzo (Edith Frank), Maya Michal Sherer (Margot Frank), Alison Quin (Miep Gies), Kevin Singer (Peter Van Daan), Domenique Lozano (Mrs. Van Daan), Michael Butler (Mr. Van Daan), Michael Patrick Gaffney (Mr. Dussel) and Paul Plain (Mr. Kraler). 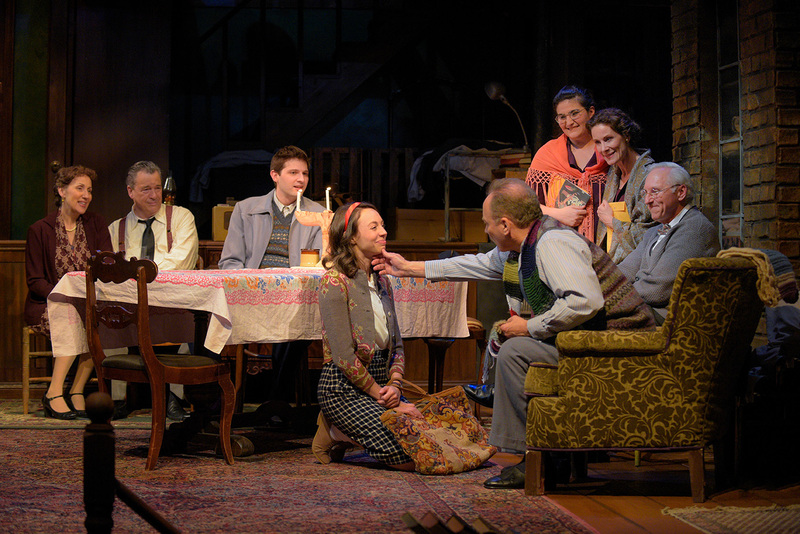 “The Diary of Anne Frank” runs through April 28 at Walnut Creek’s Lesher Center for the Arts, 1601 Civic Drive. Call 925-943-SHOW or go to lesherartscenter.org for tickets or more details. Everything about this production is exceptionally well done, from the remarkable set design by Nina Ball, costumes by Jesse Amoroso, and the splendid cast. Monique Hafen Adams demonstrates superbly a 13-year-old character’s unfettered instantaneous joy and sorrow, during her family’s ordeal her loving father, Otto, and mother, Edith, are played by Victor Talmage and Marcia Pizzo. In the original diary Anne Frank gave each of the family’s annex guests a fictitious name, so the names of the characters in the play and the movie have different names then you would find historically affiliated with the real-life event. The story characters include business caretakers Mr. Kraler (Paul Plain) and Miep Gies (Alison Quin), Miep Gies’ family dentist, Mr. Dussel (Michael Patrick Gaffney), his partner Mr. Van Daan and his wife (Michael Butler and Domenique Lozano), their son Peter (Kevin Singer), Anne’s sister Margot (Maya Michal Sherer), and last but not least, two of the Nazi soldiers described as first and second man (Joe Ayres and Justin Hernandez). As Holocaust dramas go, The Diary of Anne Frank is mercifully, almost perversely, easy to take. Center REPertory Company is presenting the adaptation by Wendy Kesselman. Born in Germany, Anne Frank moved to Amsterdam, Holland, with her family to escape the Nazis when she was 4, but the Germans took over Holland in 1940. Thus eight people lived in cramped quarters (set by Nina Ball, lighting by Kurt Landisman) with meager food and almost constant fear of being discovered. During their Hanukkah celebration, for example, Anne gave everyone a gift, but their fear was aroused when they heard a noise downstairs. Much to their relief, it came from a thief who fled. Everyone’s hopes soared with the Allied invasion of Europe in June 1944. They envisioned being free soon. Thus it was a terrible irony that they were rousted two months later and died before the camps were liberated in April 1945. Besides the set and lighting, the production is complemented by Jessie Amoroso’s costumes and Teddy Hulsker’s sound and projections.